Tolga Tüzün and Korhan Erel host the legendary San Francisco-based composer, performer and instrument builder Bob Ostertag for a series of talks, workshops and masterclasses, as well as for a recording session with him. Korhan and Tolga will record with Bob at the Bilgi University Recording Studio on March 4 at 7.00pm. This recording session will be open to public. Ostertag, Tüzün and Erel are going to play a concert at Kadıköy’s Dunia on April 8 at 9pm. 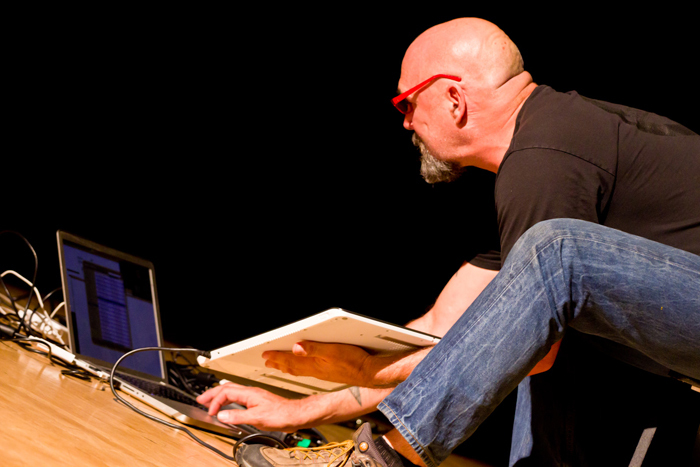 Bob Ostertag has published 21 CDs of music, two movies, two DVDs, and three books. His writings on contemporary politics have been published on every continent and in many languages. Electronic instruments of his own design are at the cutting edge of both music and video performance technology. He has performed at music, film, and multi-media festivals around the globe. His radically diverse collaborators include the Kronos Quartet, avant garder John Zorn, heavy metal star Mike Patton, jazz great Anthony Braxton, dyke punk rocker Lynn Breedlove, drag diva Justin Bond, Quebecois film maker Pierre Hébert, and others. He is rumored to have connections to the shadowy media guerrilla group The Yes Men. In March 2006 Ostertag made all of his recordings to which he owns the rights available as free digital downloads under a Creative Commons license. He is currently Professor of Technocultural Studies and Music at the University of California at Davis. This entry was posted in Performances and tagged özgür doğaçlama, Bilgi, Bilgi Üniversitesi, Bilgi University, bilgisayar, Bob Ostertag, computer, concert, controller, electronics, elektronik, Free Improvisation, Istanbul, kayıt, konser, kumanda, laptop, MIDI kumanda, piano, piyano, recording, San Francisco, stüdyo, türkiye, Turkey. Bookmark the permalink.